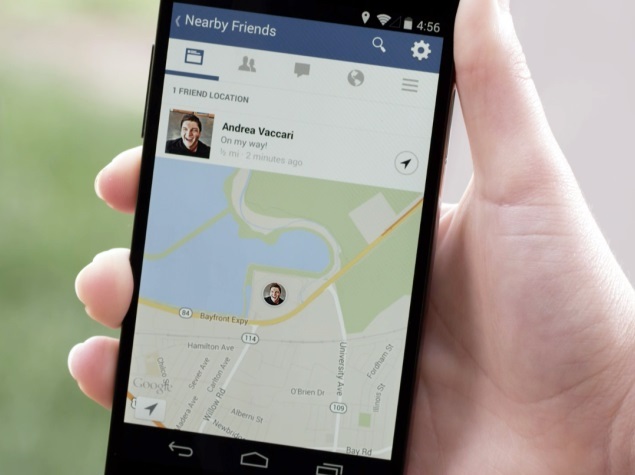 The Facebook has rolled out a new feature, which allowing the Smartphone user to discover friends’ locations which are near by them. The optional “nearby friends” feature “helps the user to discover which friends are nearby. “If the user can turn on Nearby Friends, then he will get occasionally be notified when friends are nearby, so the user can get in touch with them and meet up. With this new feature, the Facebook takes a page from other location-based services applications and social networking websites such as-Foursquare, numerous dating apps and the recently launched social network aggregator SocialRadar. With this Facebook feature, the user can choose who can see if you are nearby (for example: your friends, close friends, or a specific friends list) and you also can turn it on and off at any time according to your need. The Facebook will also allow users to share a precise location with the particular friends or a particular person for a set period of time. When the user has shared his precise location, then the friend which is chosen by the user will see exact locations are on the map, which helps the user and his friends to find each other. The the location sharing on the Facebook must be mutual: “The User and his friends both have to turn to Nearby Friends and choose to share with each other to see when they are nearby. The user friends will only be able to see that the user is nearby if the user can share this information with them and vice versa.